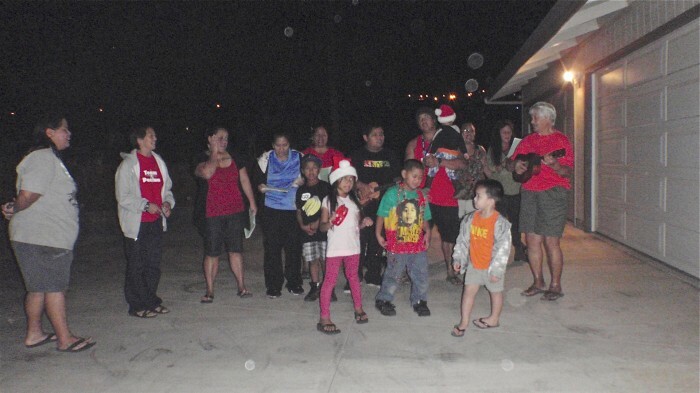 Members of the Pa'alua 'ohana sing for their neighbors at Christmastime. 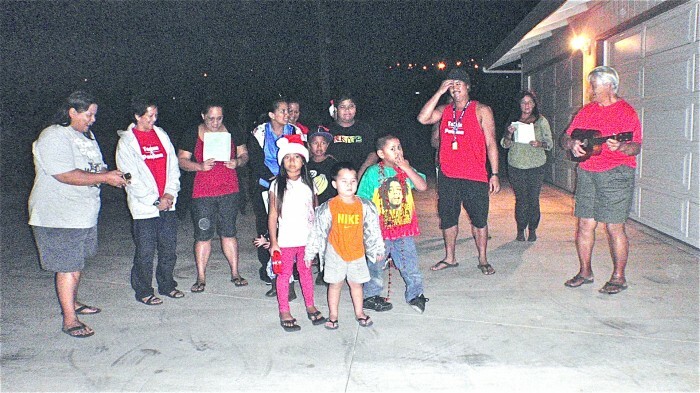 December 25, 2011 — This past Christmas week, more than a dozen carolers, all members of the Pa’alua Ohana, crowded onto driveways and fidgeted in the glowing porch lights of several homes in Department of Hawaiian Home Lands Kailapa Community in Kawaihae, Mauka. Many were crying as they sang out Season’s Greetings and songs of Christmas. The tears, however, were joyful and accompanied by broad smiles. Sonny and Libby Pa’alua live in the Kailapa Community. Their daughter Blase, with her husband Edwin and 3 young children, lived just up the road in Kapa’au. Monday morning, November 7, Edwin and Blase’s house caught fire. It took responding firefighters an hour to extinguish the blaze. The house was a total loss. Firefighting personnel praised the family for having an escape plan and executing it well. No one was hurt. But they lost everything. News of the young family’s plight spread throughout the Kailapa community and in a true spirit of giving the neighborhood responded with donations of clothes, food and other basic household items. In turn, the grateful Pa’alua Ohana, including Libby, Blase and many sisters, nieces and nephews along with the keiki, chose to sing their “Mahalo!” mele to all who had given so much. It proved to be a memorable gift for all who heard them sing. To Kailapa Association President Diane Kaneali’i it was “a humbling experience to see a family who has so little, giving back so much.” They may have lost all their possessions, but their spirit of love, faith and charity shown brightly as they blessed many families with the songs from their hearts.